A boggle-eyed pooch tucked into a Balenciaga handbag; an elite greyhound tearing around the track in a flash of fur and claws; a sniffer dog on the trail of illicit drugs. Given that dogs come in every shape, size and colour, it is strange to think they are all wolves under the skin. According to DNA studies, domestic dogs owe their origins to a wolf cub that probably fell into the hands of humans some 40,000 years ago somewhere in Southeast Asia. Over the course of thousands of years, they were shaped by humans for hunting, guarding and herding into the 400 or so modern breeds. "It's incredible what you can do with selective breeding," says Alice Dowswell, exhibition curator at the Walter Rothschild Zoological Museum in Tring, Hertfordshire. She points out two skulls of different dogs on display at the museum. One, from a St Bernard Dog, is the size of a football. The other, from a Russian lapdog, is little bigger than a ping pong ball. "It really shows you how selective breeding has changed an animal from a standard size to come in all different shapes and sizes," she explains. 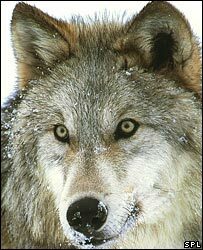 "Originally, according to DNA samples, it would appear that the domestic dog is most closely related to the grey wolf. "So the grey wolf is by far the closest match." We are standing in a small wing of the museum among numerous glass cases containing various bones, memorabilia and stuffed dogs. A group of small children are crayoning in pictures of dogs at a table, while others play a game of "guess the dog's bark" at an interactive display in the corner. The new exhibition charts the rise of "man's best friend", from feral wolf to pampered lapdog, exploring the origins of domestic dogs and their relationship with humans. Experts are divided on how wolves first entered the lives of humans. Some believe that a band of hunter gatherers took wolf cubs back to their caves, perhaps to act as early guard dogs. The exhibition, Dogs: Man-Made Friends, puts another archaeological find from the area on public view for the first time. Inside a glass case is the skeleton of an Early Bronze Age dog dug up in Tell el-Duweir near Jerusalem - the site of the ancient city of Lachish. Elsewhere in the museum, among the permanent exhibits, are glass cases containing some 88 domesticated dogs from around the world, including one of the most famous greyhounds ever, Mick the Miller. "He was a huge hero, he was around in the real heyday of greyhound racing and was an absolute superstar, he even starred in his own film called Wildboy," says Dowswell. "When he died, his body was presented to the Natural History Museum, that was in 1939, and he's been with us ever since. We still have some of his fans coming in to look at him from time to time." Dowswell hopes people will come away from the museum with a better understanding of the relationship between dogs and humans. "I think the relationship between man and dog is a reciprocal one," she says, "so although you can say we use dogs and have made them this way for many reasons, they are also looked after, they are given affection and help in raising their young by humans, so it's very much a two-way thing. "We'd like people to go away and look at dogs in the street and think about the fact they did come from grey wolves, and think about the fact that it's incredible that there are over 400 breeds in the world today; from the tiny, tiny lapdog to huge deerhounds and Irish wolfhounds."